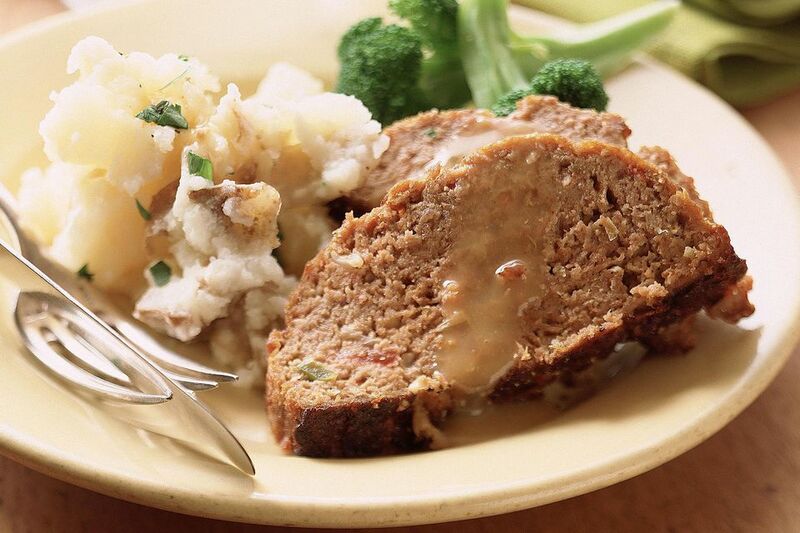 This easy meatloaf recipe sure lives up to its name. The buttermilk works its tangy magic to make this meatloaf tender and delicious. This great recipe is finished with a glossy brown sugar glaze that's a perfect compliment to the flavorful meat. Note: while there are multiple steps to this recipe, this meatloaf dish is broken down into workable categories to help you better plan for cooking. In a sauté pan, on medium heat, melt the butter. Add the onions and sauté for about 5 minutes, or until translucent. Remove from the heat, stir in the garlic, and let cool to room temperature. In a large bowl add the ground beef, the onions, and all the remaining meatloaf ingredients. Mix to incorporate. Lightly grease the bottom of a shallow roasting pan with a few drops of oil. Wet your hands with cold water and form the meatloaf mixture into a loaf shape, about 6 inches wide, by about 3 to 4 inches high. While the meatloaf is baking combine the brown sugar, vinegar, and Dijon mustard in a small bowl for the glaze. After 30 minutes, remove the meatloaf from oven and evenly spread the glaze over the top with a spoon. If you like, you can put a little of the glaze on the sides, but most of it should go on the top.